When I was a teenager, I remember visiting my paternal grandmother and she loved making the turkey in a bag recipe shown below. She was the only one I knew that made turkey using Reynolds Oven Bags. In fact, she made all of her roasts this way too. When I asked her why she preferred to roast meats this way, she told me there are three primary reasons. When I made my first Thanksgiving dinner after I was married, I called my Mom and asked for her famous Sausage Stuffing Recipe and I asked my Grandma for her turkey in a bag recipe. 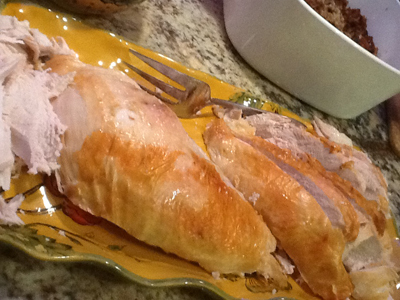 To this day, we follow both of these treasured family recipes whenever we make stuffed turkey. First thing you will need is a turkey bag. I always buy the Reynolds brand as shown here. They make different sizes so make sure you get the one for turkey. Whenever you use a bag for cooking, you have to sprinkle one tablespoon of flour inside the bag. The directions on the box say that it keeps the bag from bursting while cooking. Lay the bag inside a roasting pan. We like to use a disposble one which makes clean up a breeze. If you want a tasty gravy, roughly chop a couple of onions, a few stalks of celery and a couple large carrots and place them in the bottom of the bag. Remove turkey from packaging and discard bags of gizzards usually found inside the neck cavity. Rinse the turkey and pat dry. Rub 2 tablespoons of butter over the top of the turkey and sprinkle with kosher salt and fresh black pepper. Stuff the bird with your favorite stuffing (try my Mom's at the link above!). The next step is to get the turkey inside the bag. Depending on how big the turkey is, you may need a helper for this step. Usually I hold open the bag and my husband lifts it and gets it inside. 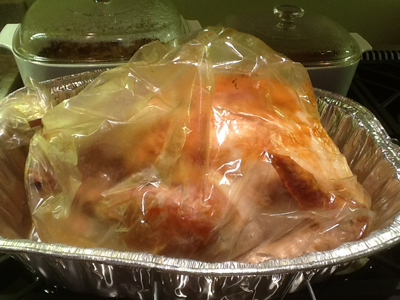 Once the turkey is inside the bag, cut a few air holes in the top of the bag to allow the steam to escape and then tie the bag with the twist ties provided by Reynolds. Do not use regular twist ties as they will burn in the oven. Also don't tie the bag too tightly. Leave some room between the bag and the bird. In order to figure out how long to cook the turkey, you need to know two things: the weight of the bird and whether or not it is stuffed. 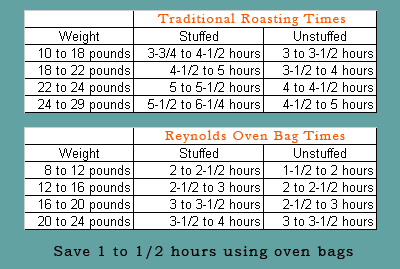 If you buy Reynolds Oven Bags the cooking times below will be inside the box but here they are anyway. I added traditional roasting times (without a bag) just so you could see the difference. My Grandma was on top of her cooking game and started using oven bags way before they were popular, at least 25 years ago. 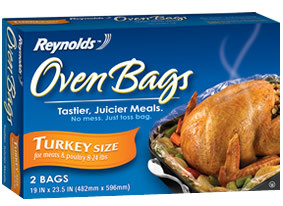 If you use Reynolds Oven Bags to cook your turkey, no basting will be required, dinner will be on the table at least an hour sooner, the bird will be melt-in-your-mouth moist and clean up will be easier than ever. Find more Thanksgiving recipes here.